Last year, I did the Scrap Dance Mystery Quilt hosted by Carole at From My Carolina Home. It was my first mystery and I loved it. She's doing a new one this year, called Scrap Dance Tango. I'm behind, but I am slowly working on it. The last time my dad was here, he mentioned that he'd like a quilt. He's the only one in my immediate family who doesn't have a quilt I've made, so it seemed a reasonable request. He will get Scrap Dance Tango for Christmas. Since it's for my dad, I picked a light blue, close to Carolina Blue, as the background color. I'm using Kona Blueberry. I'm not really narrowing down my scraps other than to eliminate batiks and solids, so the scraps will be truly scrappy and relatively unsorted. I got all my background 2 1/2 inch squares cut today. I don't have all my scrappy 2 1/2 inch squares yet. I also need 1100 half square triangles. Yup. That's a lot. I got an Accuquilt machine for my birthday last year and I think that's the only reason the idea of that many HST doesn't have me running. The Accuquilt means I don't have to trim the finished units and the dog ears are already cut. I did a test run today and now have 12 HST done. Only 1088 to go! Carole suggests just doing a few at a time, since you need them throughout the process. My plan is to chain piece HST for 10 minutes each time I sit down to sew. Hopefully that will add up to all that I need in a slowly but surely sort of way. I finished the growth chart for Elliot! My husband decided on Munchkin's 2nd birthday that he wished we had a growth chart. My first thought was a wall cling one, but he wasn't crazy about that. I looked at some panels that are meant to be growth charts, but we didn't like any that we found. After browsing some images online, I was ready to commit to making one. I created mine by combining 3 different inspirations. This Moda Bake Shop tutorial by Vanessa from the Craft Gemini, this picture of charts made for twin boys, which were based on this picture that I guess originally had a tutorial but the link is now broken. The background is Kona Cloud. The binding and letters & numbers are Kona Clover. The backing is Ahoy Primatey--we find the phrase hilarious. I ordered 3 different 1-yard cuts from Etsy a year or more ago and didn't know exactly what to use it for. I'm glad to have found a use for one of the yards. It's a really fun print. The numbers are some I already had to trace from making beanbags. The letters are from my new Accuquilt machine and the alphabet die. I cut the thinner background stripe 3 1/4" wide, the wider background strip 6 1/2" wide, and the strip sets 5 1/2" wide. The finished product is 14" wide. I quilted in between each jelly roll strip, so the lines are every 2 inches. I am embroidering the measurements. 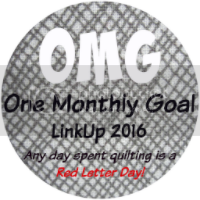 This was my February goal for OMG hosted by Heidi at Red Letter Quilts--I was goal-setter 91. This was also on my list of Q1 goals for the Finish Along; you can find my goal-setting post for the FAL here. Shari is queen of my hive in the stash bee this month, and she asked for heart blocks. They were so much fun, and so quick & easy that I made her three. And I had so much fun with those, I made four more for me and turned them into a mini! It's still just a top, because I knew I wouldn't get it completed before Valentine's Day. I also decided to crash hive 6 and make some 3/4 log cabins for Rebecca. I hadn't really done improv piecing before, and I had a lot more fun with this than I expected. I lost some of the wonkiness when I trimmed them to size, which I'm sorry for now, but I'm still pleased with how they turned out. I may even add an improv project to my bucket list. I'm combining a Moda Bake Shop pattern with a few pictures I've found online into my own pattern. I've got the fun part pieced, a really long stripe of I Spy fabrics. 80" long! Finishing the growth chart is my February goal for OMG: One Monthly Goal. Many thanks to Heidi at Red Letter Quilts for hosting this great motivational challenge!